Alexandra Bullen has been a playwright, waitress, barista, gardener, script reader, yoga instructor, and personal assistant. She grew up in Massachussetts, went to college in New York City, and lives most of the year on Martha’s Vineyard (except when she’s visiting San Francisco). Visit Alexandra Bullen’s website. Wish — (2010-2011) Young adult. Publisher: For broken-hearted Olivia Larsen, nothing can change the fact that her twin sister, Violet, is gone… until a mysterious, beautiful gown arrives on her doorstep. The dress doesn’t just look magical; it is magical. It has the power to grant her one wish, and the only thing Olivia wants is her sister back. With Violet again by her side, both girls get a second chance at life. And as the sisters soon discover, they have two more dresses — and two more wishes left. But magic can’t solve everything, and Olivia is forced to confront her ghosts to learn how to laugh, love, and live again. 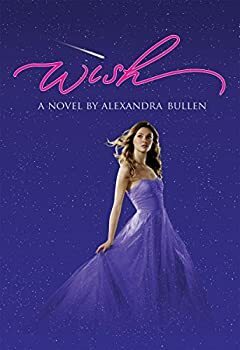 In a breathtaking debut from Alexandra Bullen, WISH asks the question: If you could have anything, what would you wish for? Olivia always lived in the shadow of her outgoing twin sister Violet — until Violet died. Now, Olivia is starting over, with a new home, a new school, parents who have become strangers to her, and a hole in her life where Violet should be. Everything changes when Olivia takes one of Violet's dresses to be mended, and meets the mysterious seamstress Mariposa of the Mission, a.k.a. Posey. Instead of repairing Violet's dress, Posey makes Olivia a beautiful new one. This is not just any dress; it comes with a wish, and the promise of two more dresses and two more wishes.